This week I think the war on free speech is escalating. I read Drudge Report each morning. It tells me what mainstream media will be talking about tomorrow or the next day. Today it leads with 7 articles about attacks on free speech. 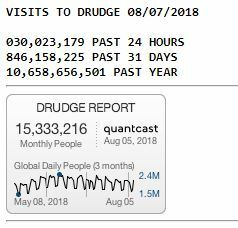 For those unfamiliar with the Drudge Report, it is a ‘news aggregator’. Very seldom does Mr. Drudge actually include any of his writing in the Report. So, it is like Feedly, Newsify, gReader, and other aggregators. Image – Drudge Report is popular. The stats are approaching 1 billion page views per month. Today it points to articles from; CNN, NYT, WaPo, The Sun (UK), Mirror (UK), Whimn (AU), The Hill, CBS Sacramento, Rolling Stone, Reuters, Yahoo News, Bloomberg, NBC, Daily Star (UK), Space.com, USA Today, Chicago Tribune, Zero Hedge (considered a conspiracy site), AP News, Axios, Politico, FNC, SF Gate, and that is just a partial list from today. 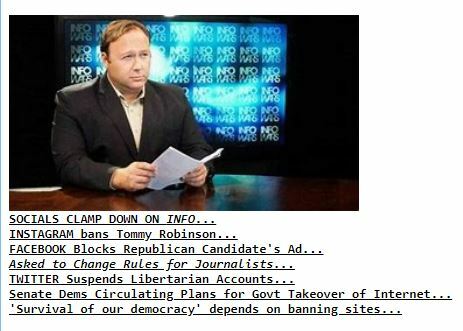 A number of sources proclaim Drudge Report as extreme right-wing. If you read the list above, you’ll wonder how that is possible. Blue is Left and Red is Right. Uncolored text is center or unknown. My list is taken from today’s Report and I took them as I found them. I skipped some like The Smoking Gun because I don’t recall ever seeing them in the Report and didn’t consider them representative. Those I listed I see almost every day. The Report’s stories are pointed to without comment. Other than a modified headline which leaves little, if any, room for spin. So, Drudge Report bias, if it exists, can only come from their selection of articles. The significant majority of articles are from Left and Center-Left sources. So, it is the Left claiming one pointing to their words is extreme right-wing? Really!?! This morning I see these articles at the top of the page. 1) This article is about Alex Jones. He is the one behind a ‘conspiracy’ site. So, it is OK to shut him up. Think about that. 4) This is a story about the rules Facebook uses to control those using its site for research. The elites want special privileges for access to knowledge/information the rest of us can’t have. 5) This is a story from a conspiracy site. The thing of interest in it is the speed with which the big social sites are banning the same people. It strongly suggests coordination of some kind. Trusting such sites is questionable. However, completely ignoring them is foolish too. They do occasionally break stories that turn out to be major scandals. Think The Inquirer. If you are a thinking and skeptical person, they can provide a heads up. 6) This is the scary one. The story originates on Axios. You’ll find a copy of the document on Axios. And the document can be downloaded as a PDF here. 7) Here the Examiner is reporting on a Democrat Senator calling for censorship. In all cases it is the Left’s leadership in the Democrat Party that is endeavoring to protect us by silencing voices. We obviously aren’t smart enough to recognize that Alex Jones has walked off the end of the pier. This type of protectionism and progressive leadership came into vogue with Mussolini and Roosevelt. The German National Socialist Party had a similar concept as a plank in their party platform. We know truth nor protection were the goals of this platform point. Goebbels was in charge of media in this time and operated on the idea of big lies told often. The idea of this noble sounding platform plank was total control of the media and silencing the opposition. Mussolini took Engels’ ideas and made a more popular form of socialism politicians felt would be more effective at mobilizing the masses, which became known as fascism. The historic descriptions of Fascism sound very much like what people say Democratic Socialism is. The National Socialist Party of Germany built on the Mussolini-Engels’ ideas and the party platform was created. One has to question why the ideas promoted by the neo-Democrat leadership can be found in a fascist party platform of 1920 and 1932? They are actively working to eliminate free speech. Each person has to decide if they will support those ideas and recognize them as the fascists concepts they are. History tells us where those ideas will lead us. This is not solely a Leftist idea. It seems 43% of Republicans want to give Pres. Trump the right to shut down media outlets… (Ref – Daily Beast) Is that scary!?! Principals are important. The good ones are enshrined in the US Constitution. Think about Whether your candidate choices are people that support the Constitution or a fascist platform. This entry was posted in Philosophy and tagged Free Speech. Bookmark the permalink. ← Lakefront Property on Mars?